A K-pop band like no other, EXO have been dominating charts and stealing hearts since they debuted in 2012. For the first time, this unofficial biography will tell their extraordinary story. 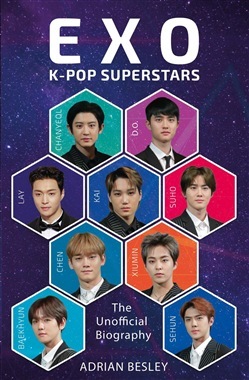 Extensively researched, this book weaves in the backstories of each of the nine individual members with the story of the band as a whole, as well as detailing the support from their incredible fanbase, EXO-L. As any EXO-L knows, EXO come from an alien planet and possess superpowers – not hard to believe when you see how talented they are! They record their songs in Korean, Mandarin and Japanese, they have millions of fans all over the world, their music videos clock up hundreds of millions of views, and a captivated global audience watched this Korean-Chinese band close the 2018 Winter Olympics in South Korea. No wonder Dazed magazine called them the ‘biggest Korean boyband in the world’. Featuring biographies of each of the nine current members – Suho, Xiumin, Lay, Baekhyun, Chen, Chanyeol, D.O., Kai and Sehun – as well as previous members Luhan, Kris and Tao, and taking an in-depth look at what makes them stand out from the K-pop crowd, this accessible and upbeat book is a must for any fan of one of the biggest bands on the planet. Acquista EXO in Epub: dopo aver letto l’ebook EXO di Adrian Besley ti invitiamo a lasciarci una Recensione qui sotto: sarà utile agli utenti che non abbiano ancora letto questo libro e che vogliano avere delle opinioni altrui. L’opinione su di un libro è molto soggettiva e per questo leggere eventuali recensioni negative non ci dovrà frenare dall’acquisto, anzi dovrà spingerci ad acquistare il libro in fretta per poter dire la nostra ed eventualmente smentire quanto commentato da altri, contribuendo ad arricchire più possibile i commenti e dare sempre più spunti di confronto al pubblico online.